How to Extract Time Series From NetCDF Files. How Can We Use NetCDF Extractor? Browse specific CMIP5’s model from the system (Fig. 2). According to the selected file (Precipitation value of MIROC4h-rcp45…), after browsing the NetCDF user can observe the range of latitude and longitude according to Fig. 3. In this Figure you can see the ranges in according to the selected model of CMIP5. It is necessary to select the ranges of data grids. Note that your input data should limit to the selected file’s attribute. In Fig. 3 you can see the ranges of selected file. In this example the whole latitude is located to [1: 320] and latitude is located to [1: 640]. In the “Time Frequency" option, user can type the frequency of time, according to the ranges that was showed above of this option (for example according to the browsed file, the entire time frequency in this sample is equal to [1:365], so user can type 1 to 365. Due to the descriptions in Fig. 4, three values of attributes have filled with appropriate amounts. These are the information of grid number, so all of them are integer without float numbers. 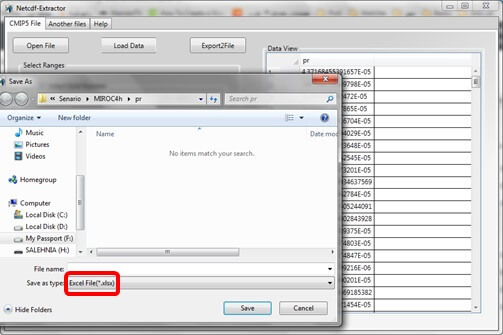 By selecting the “Export2File" button, user can save the aim file in an Excel format file (Fig. 6). The unit of precipitation is the same as the main NetCDF file that the NetCDF user browse it at the first step. Since the CMIP5 data files follow a specific standard, therefore we can read NetCDF files in two way (Grid Number and Grid Domain). 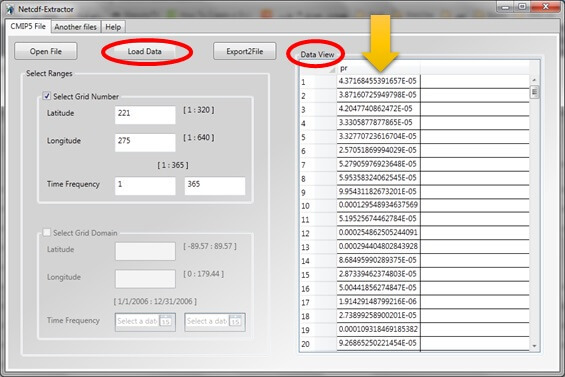 If a user click on “Select Grid Domain" checkbox, he/she can type the value of latitude and longitude of a desirable point(Just for daily CMIP5 data) with time frequency of a specific period (Fig. 7). In Fig.7 you can see a sample that has filled in the blanks of Lat, Lon, and Time Frequency. In this sample the main range for latitude, longitude and time frequency are respectively equal to: [-89.57:89.57], [0:179.44], and [1/1/2006: 12/31/2006]. In Fig. 7, there is a sample for each attribute. According to this example the value of latitude is 36.26, longitude is 59.63 and the time frequency is 2/16/2006 to 12/31/2006. As Fig. 7 the Data View table present the date of precipitation value, day by day, according to selected time frequency. 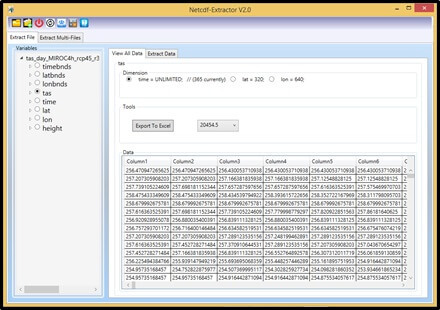 In the NetCDF Extractor, the NetCDF user can also read another dataset format files, such as CRU, AgMERRA, CORDEX, and etc. In Fig. 8 we select AgMERRA dataset for an example. The format of AgMERRA dataset is .nc4. You can easily extract your aim point by “NetCDF Extractor Tool". 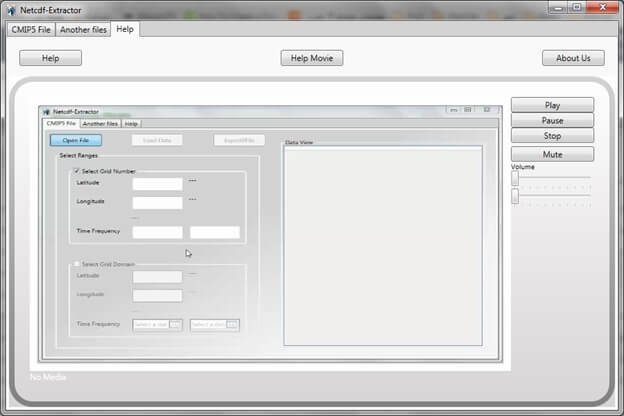 A sample was presented for better understanding this part of software, according to the movie help file. 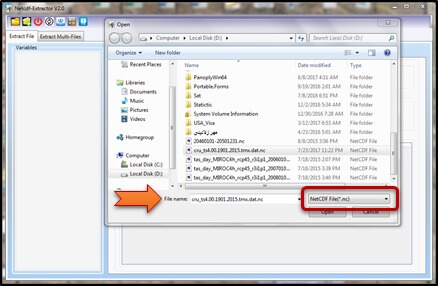 In this step, after clicking on the “Another Files", user can select “Open File" button and browse the desirable data file. In this phase the NetCDF user can see the list of variables, according to the basic AgMERRA file. In the list of variables there are some descriptions about characteristics of the file. You can fill in the blanks, namely, variable’s name, origin and shape according to this descriptions. Let’s to review an example of AgMERRA data. In Fig. 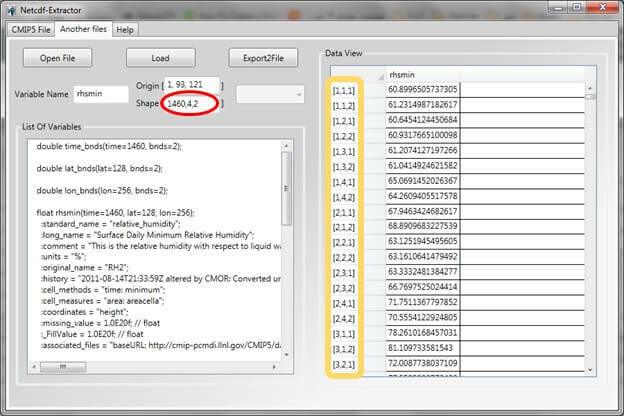 8, we load minimum relative humidity that the name of this variable is “rhsmin" in AgMERRA datasets. Note, the rhsmin has three attributes in this “.nc4" AgMERRA file. This amounts are shown in “List Of Variables" in Fig. 8. The allowed ranges are: time=1460, lat=128, and lon=256, so the NetCDF user can fill the blanks according to this ranges. Be careful about the “Variable Name", it should be equal to the name that it is located in the “List Of Variables", see the Fig. 8 and “red line" that is assigned to “rhsmin". For the “Origin" you should select three items, namely time, latitude and longitude and separate them by comma. For the “Origin", fill the blank according to the specific range. In this sample it is equal to: [1, 93, 121], that Time -> 1, latitude -> 93, and longitude -> 121. [1, 1, 1]=60.89965057, it means that the value of minimum relative humidity in time=1, lat=1, and lon=1 is equal to 60.89965057. These values will continue up to the selected amount that user selected them in the “Origin" and “Shape" fields. For better understanding of the concept of “Shape", pay attention to another example that is presented in Fig. 9. According to the Fig. 9, you can see that the value of “Shape" is equal to [1460, 4, 2]. Note to “Data View" table in Fig. 9, the number of attributes is start from [1, 1, 1], [1, 1, 2], then [1, 2, 1]…. This is so important that you perceive these amounts. This changes due to the amount of “Shape" field. Finally, user can save the output file in the Excel format file. As we mentioned, the NetCDF user can extract other different datasets in .nc format such as CRU, AgMERRA, CORDEX, APHRODITE and etc. The “Help" tab is the last tab in the “NetCDF Extractor" software. For better understanding view the movie help file. In this movie you can follow all the steps one by one. The Fig.10 present this screen. the NetCDF user. - The NetCDF Extractor software application can extract every of "nc" files, however the ability of the tool for extracting huge database is depend on user’s system RAM. 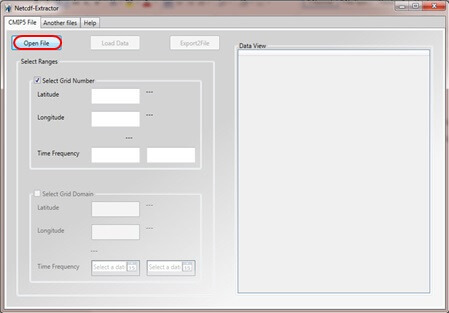 - In every step, the NetCDF user can easily convert nc data to excel, text, json and csv files. Merge NetCDF files and extract once. How Can We Use NetCDF Extractor V2.0? In the first version of NetCDF Extractor, the NetCDF user can load one file to extract desirable region. Many users need to run several files simultaneously. 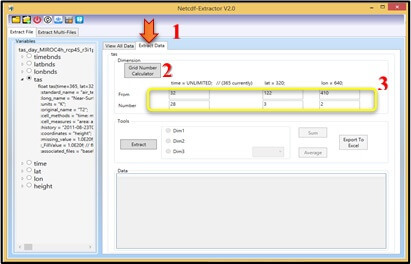 Therefore, Agrimetsoft has developed the new version of NetCDF Extractor (NetCDF Extractor V.2.0) for extracting many files at the same time. There is menu bar on the top of the main window. In this menu, the first icon is related to load one file, and the second one for loading several files (Fig. 1, No.1 and No.2). 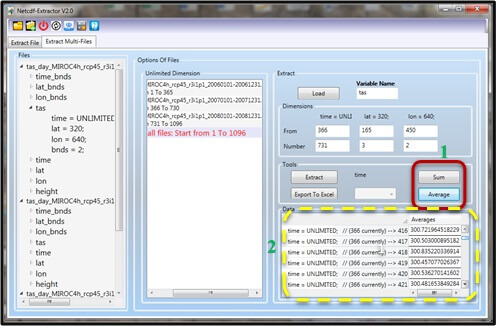 If the NetCDF user selects the first icon, in the first point, the NetCDF user can select the “Extract File" (Fig. 2). NetCDF Extractor Fig. 1 Select the first or second icon of menu. NetCDF Extractor Fig. 2 Select the “Extract File" tab. Then, browse the .nc file from your system (Fig. 3). When the input file was selected, the NetCDF user can observe all the variables of the file at the left corner of the screen (Fig. 4). According to the loaded file in this example, the main variable of this file is “tas" (temperature), so you can selected the related radio button as Fig. 4, No. 1. 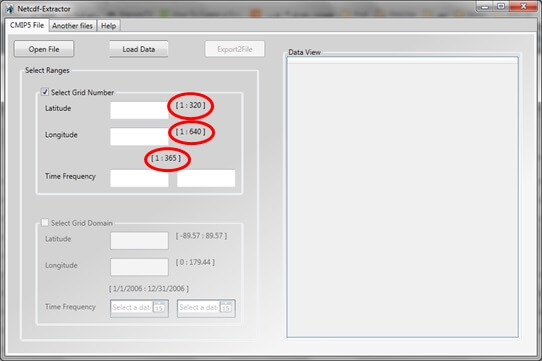 In this screen you can see two tabs: 1- View All Data, and 2- Extract Data. 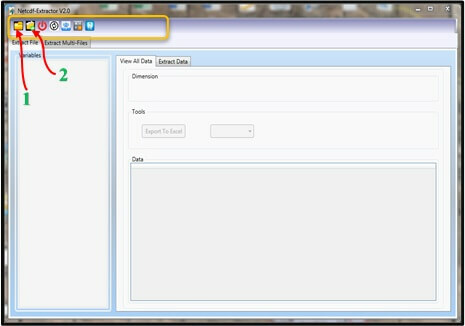 At this section, the NetCDF user start the process by the first tab (View All Data). 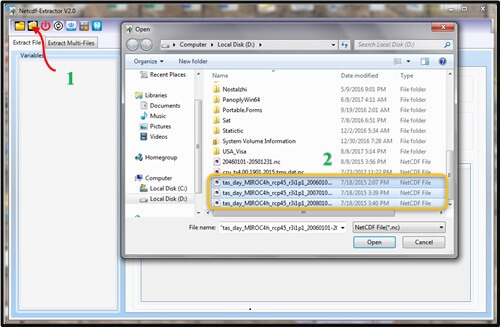 In this tab, the NetCDF user can just view the content of the file, and he/she can’t extract the data at this tab. 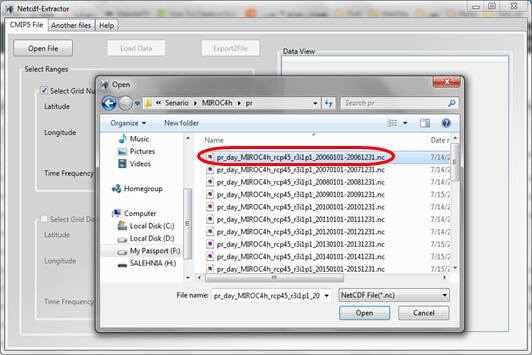 The example browsed file (in this help file) is the mean temperature of “MIROC4h_rcp45…" from CMIP5 data. You can see different variables such as tas, lon, lat, time, and height. By selecting one of the variables you can see the descriptions of them. In the Fig. 4, No. 1, the “tas" was selected, so the “dimension" panel shows three variables related to “tas" (Fig. 4, No. 2). Pay attention, in this part with three variables, when the NetCDF user select time, so in the “Tool" panel (Fig. 3, No. 3), you can see the value of “tas" for the selected time. It means that “time" is variable (the NetCDF user can choose every day from the first day of the file up to the end of date of it), but “lon" and “lat" are constant. 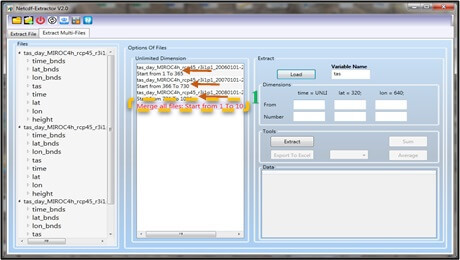 the NetCDF user can easily save and export the data to an Excel file. If you want to see the details of selected variable you can expand the triangle sign that located in the “Variables" panel, for see them (Fig. 5). At this information you can check the values of “lat", “lon","unit", and etc. NetCDF Extractor Fig. 3 Browse the desired file. NetCDF Extractor Fig. 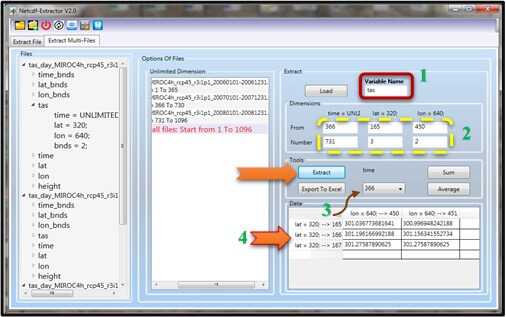 4 Select the “Extract File" tab and the variable. NetCDF Extractor Fig. 5 Expand the selected variable for further information. NetCDF Extractor Fig. 6 The “Extract Data" tab with other options. NetCDF Extractor Fig. 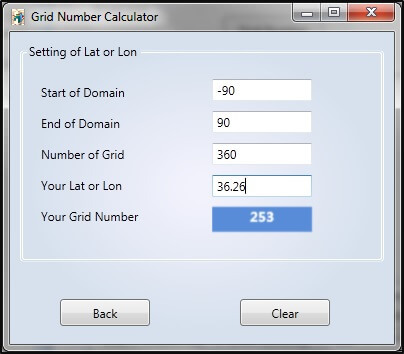 7 The “Grid Number Calculator" with other options. 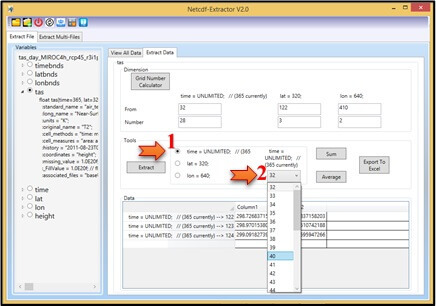 In the second panel (“Tools"), the NetCDF user can start the extract process by easy setting. As you know, in this example there are three variables, namely, time, lat, and lon. 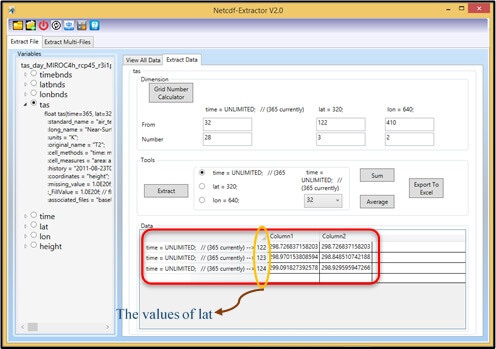 When the NetCDF user wants to extract the data, he/she would select one of the variable as a non-constant one. For better understanding, see the Fig. 8, No. 1. In this example imagine that the NetCDF user wants to extract the data of February 2006. So, in the “Dimension" panel, he/she has entered 32 up to the end of February (Number=28). Finally, in the “Tools" panel, the time option has been selected and in the combo box (Fig. 8, No. 2). NetCDF Extractor Fig. 8 The “Tools" panel with other options. NetCDF Extractor Fig. 9 The “Data" panel with the first day of Feb. of 2006. 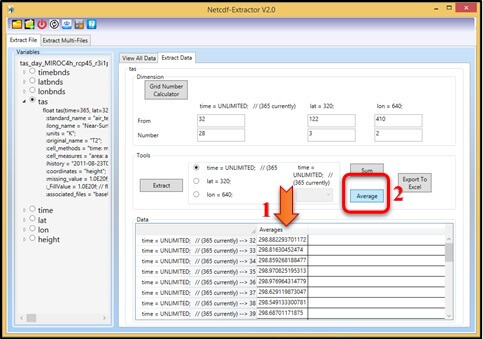 In this section the NetCDF user can extract the selected data, furthermore he/she can calculate data’s sum or average of the selected region. By clicking on the “Average" button, the average values of selected area are presented in the “Data" table (Fig. 10, No.1). 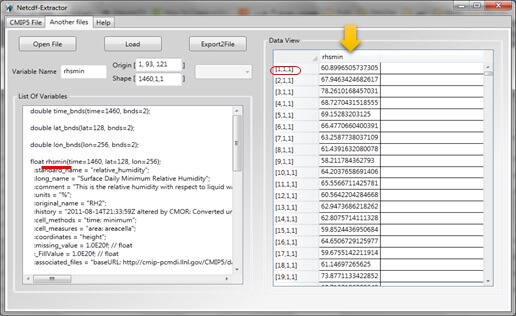 By clicking on the “Export to Excel" the NetCDF user can easily export the data to an excel file (Fig. 10, No. 2). In the “Options of Files" panel, you can see an important tip, namely: “Merge all files: Start from 1 To 1096" (Fig. 13, No.1). Due to the selected files in this example are related to the “temperature" of MIROC4h from 2006 up to 2008 (1096 days) so, all these files merge in this panel. NetCDF Extractor Fig. 13 The “Merge all files" sentence in the “Option of Files". In the “Extract" panel, the NetCDF user would write the exact name of variable that present in the file (in this sample: “tas", Fig. 14, No. 1). In the “Dimensions" section, the NetCDF user can enter the desirable area such as “option 1, Fig. 6, No.3", by selecting the area, the NetCDF user can start the “extract" process (Fig. 14, No. 2). In this example, the NetCDF user write the start time from “366" up to “731", it means that the 2007 was selected. In the “Tool" panel, the NetCDF user select “366" from the combo box (Fig. 14, No. 3). 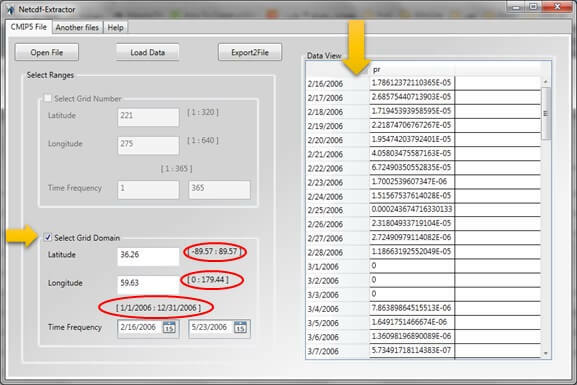 According to the number of “lat=3" and the number of “lon=2", hence, in the “Data" panel you can view a table with two columns (lon) and three rows (lat), for the values of “tas" in the day of 366 (Fig. 14, No. 4). NetCDF Extractor Fig. 14 The “Extract" panel with variable’s name. In the Fig. 15, No.1 you can see two options: “Sum" and “Average", such as option 1 in the Fig. 10, No.2. 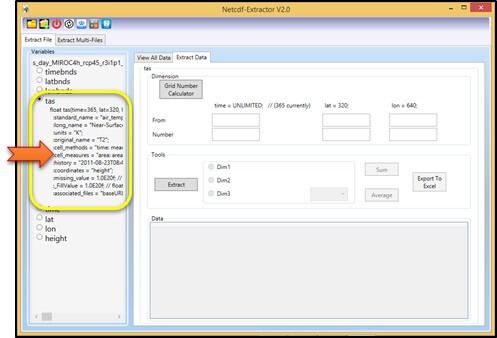 It is an important option for the NetCDF user to calculate the sum or average of a variable for the selected region Fig. 15, No.1. In this sample, the “Average" button was selected and the average of values was presented in the Fig. 15, No.2. Finally, by clicking the “Extract" button the NetCDF user can easily extract the value of “tas" of the selected region. 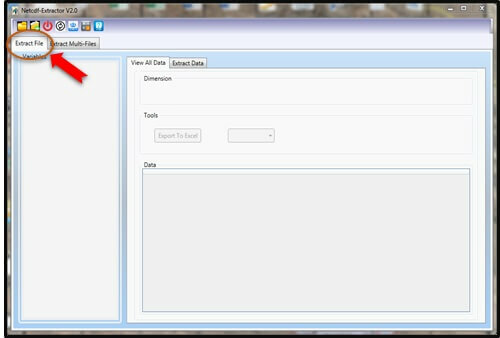 Through the “Save To File" button, the NetCDF user can export all the extracted data output to an excel file and it is so useful. - The NetCDF Extractor software application can extract all type of “.nc" files, however the ability of the tool for merging and extracting huge database is depend on user’s system RAM. We didn't found any limitation with 3 GB RAM and Doual-Core CPU. One of our customers can merge 56000 files and extract once with 12 GB RAM and Core i7 CPU system. 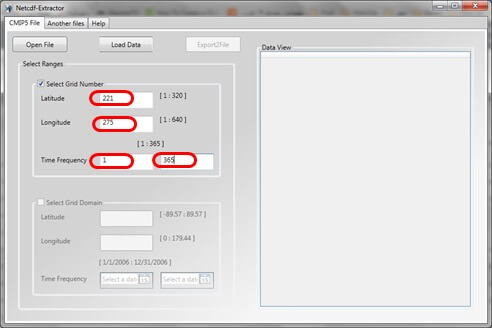 - In every step, the NetCDF user can easily convert nc data to excel, text, and csv files. What are the abilities of NetCDF Extractor?